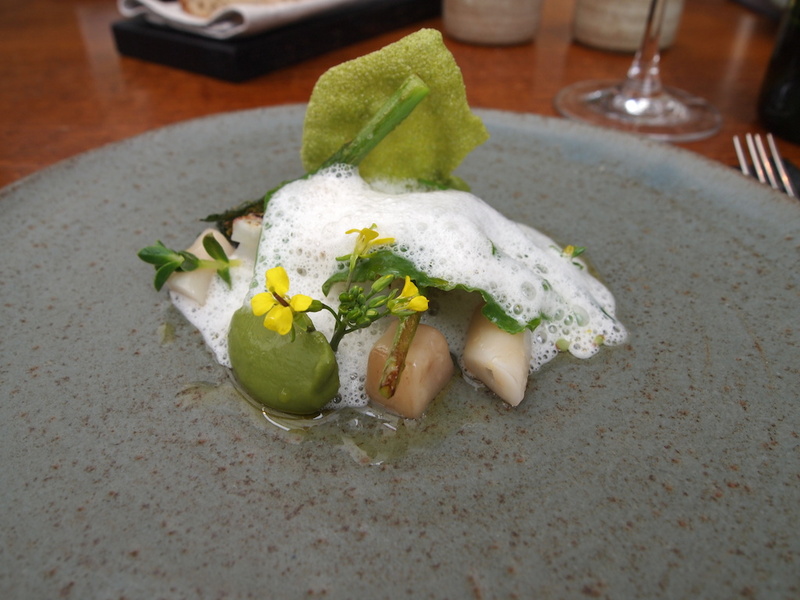 About a year ago I had a truly dazzling meal at Simon Rogan's Fera at Claridge's in London. 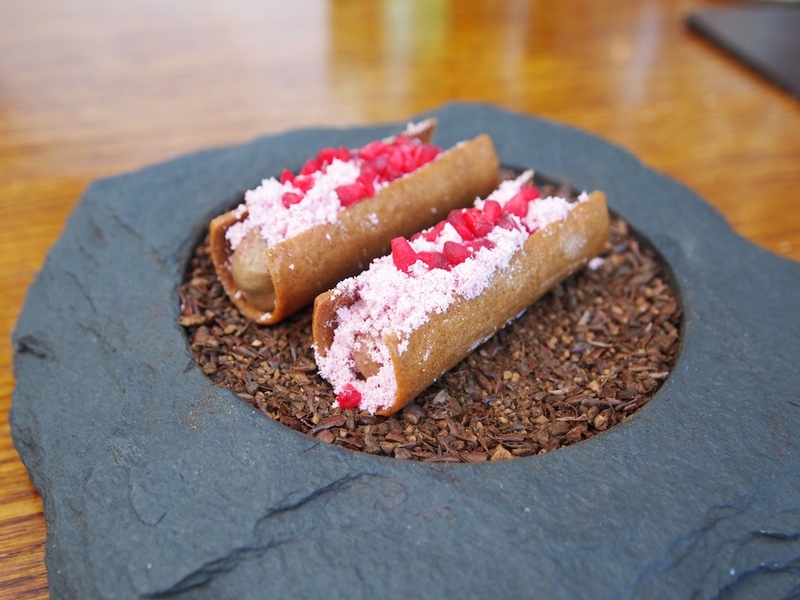 An exceptional experience that made go back there twice, but it also made me desperately want to go to Rogan's famed two Michelin starred restaurant up north in the Lake District: L'Enclume. And so here we are, a year later, at the mothership in Cartmel, because this where it all started back in 2002. 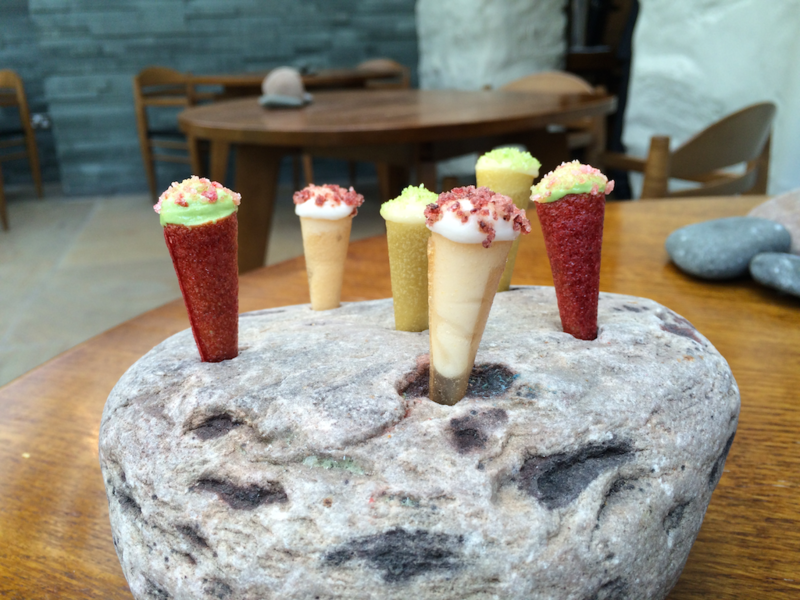 L'Enclume is open for lunch and dinner daily, except for lunch on Mondays. At lunch there's a choice of two tasting menus, including a vegetarian option, priced at £45 for the small tasting menu and £120 for the large tasting menu (currently around 14 courses). For dinner it's the large tasting menu only. 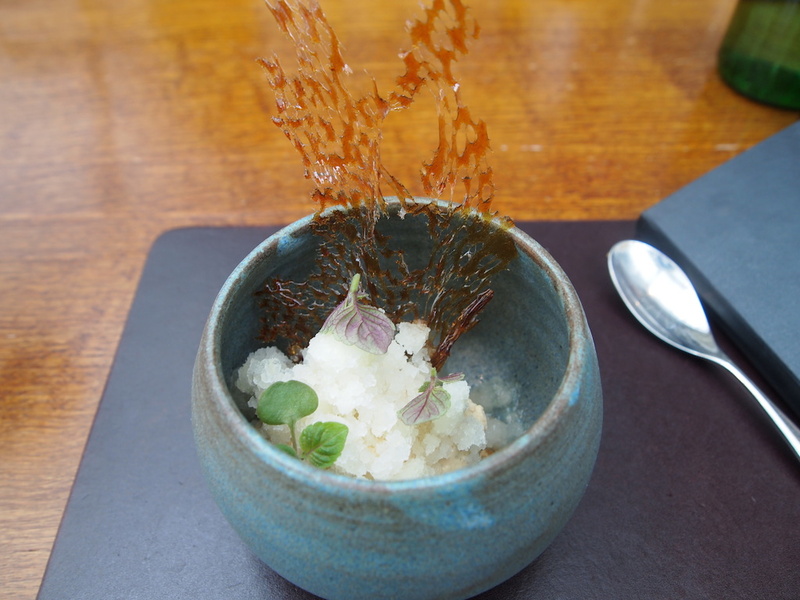 I had lunch with my husband at L'Enclume on Saturday 20 June 2015 and we both ordered the large tasting menu. The first six courses were small dishes/snacks. 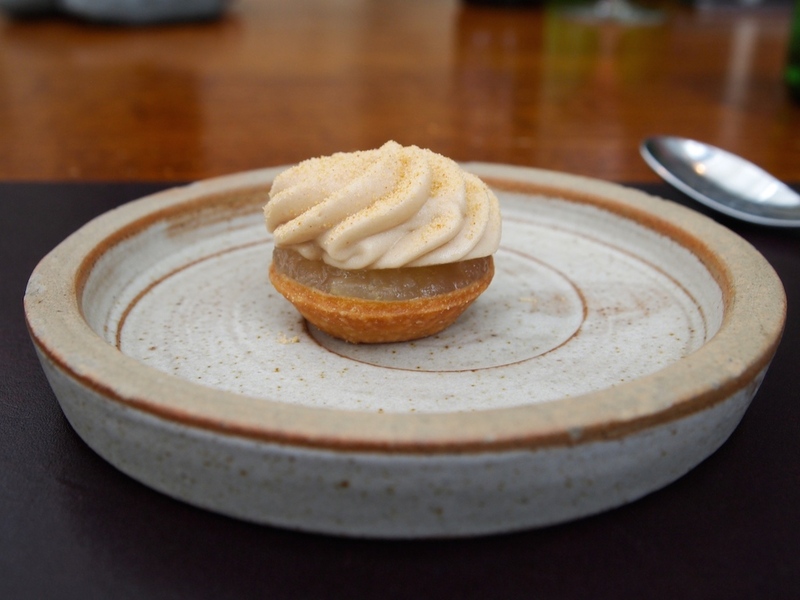 To start there was an oyster "pebble", a delicate apple meringue with a creamy liquid oyster filling. A really lovely combination, with elegant sweetness from the meringue and the oyster providing a nice briny finish. 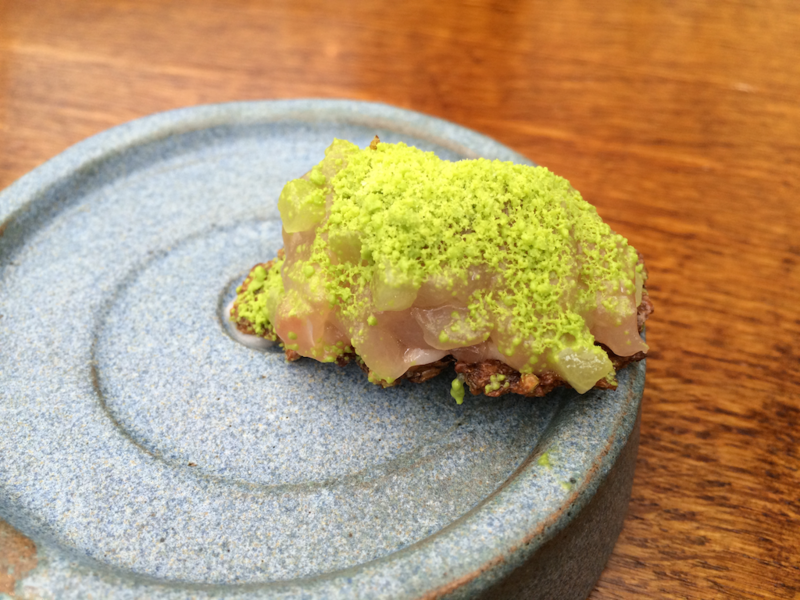 Next up was a crisp malted wheat cracker topped with chopped raw mackerel and dill snow. A fantastic bite with a wonderful textural and temperature contrast. This was followed by a steamed oxtail dumpling, coated with buttery cheese breadcrumbs. 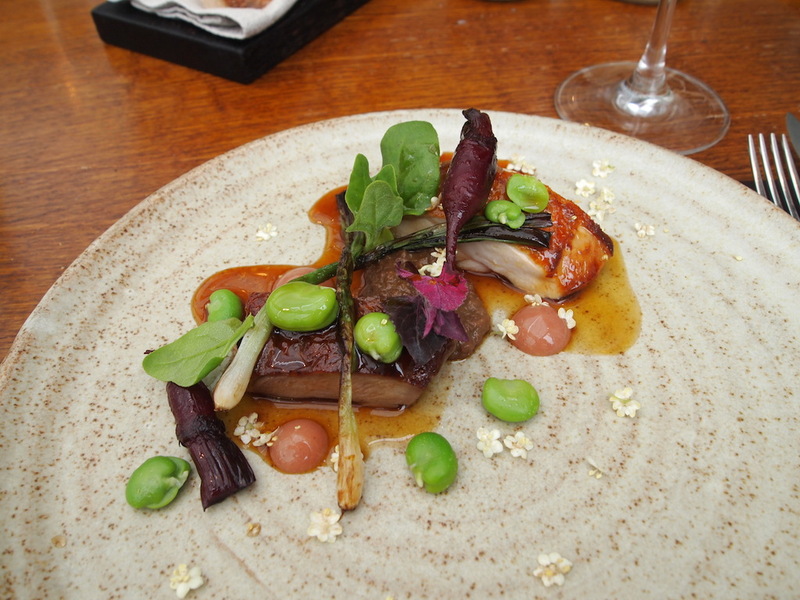 The oxtail flavours were very elegant and, again, the textures were great. 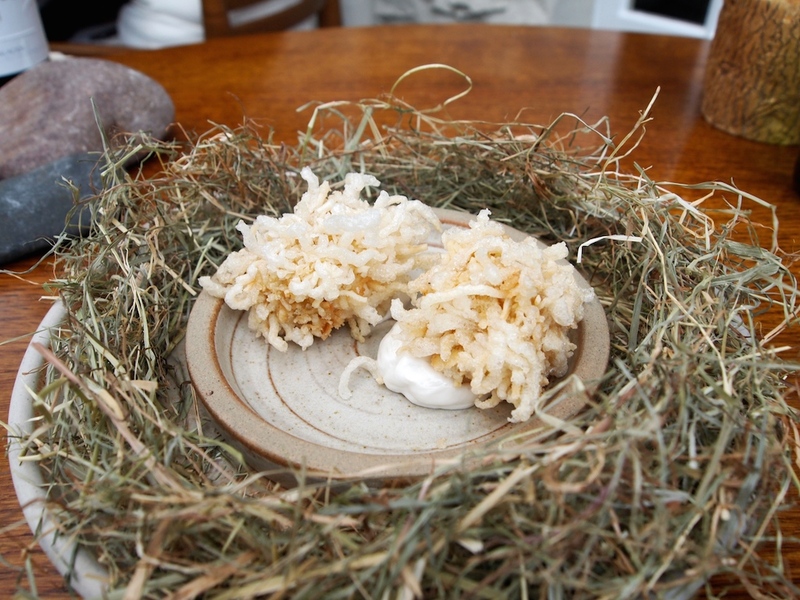 Then there was a delicious bite of smoked eel and soft pork belly, coated with crisp deep-fried shallot-flavoured tapioca, and served with a ham fat dip. Once you bite through the crunchy tapioca you get this amazing soft filling or pork and eel, and I loved the distinct pork flavours in the ham dip. 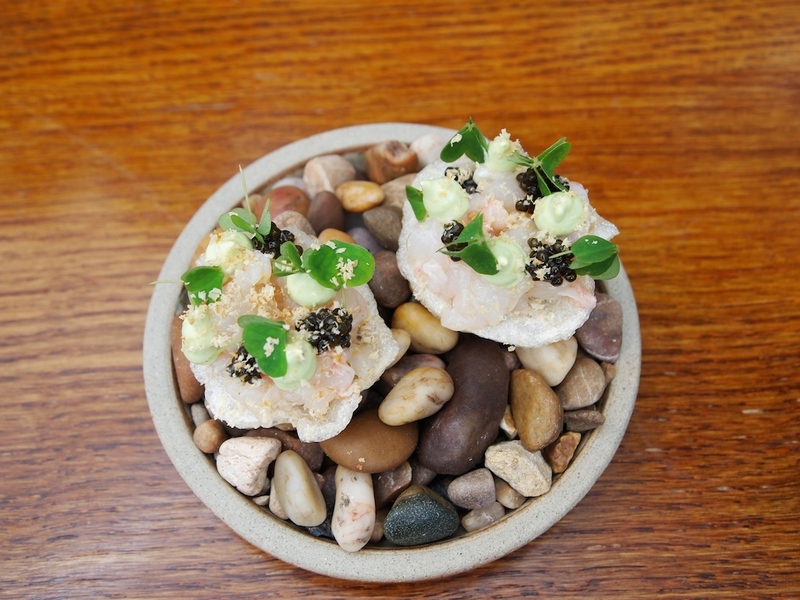 Even better was a crisp pork skin cracker with raw langoustine tartare and a few dots of sorrel emulsion and caviar. A wonderfully light and delicate bite with impeccable, nuanced flavours. The langoustine was sweet and creamy and the sorrel delivered just the right touch of sharpness. Last to arrive was a so-called asparagus and shrimp sack. At the bottom of the little sack were sliced green asparagus and Morecambe bay shrimps, lightly coated with a creamy sauce. 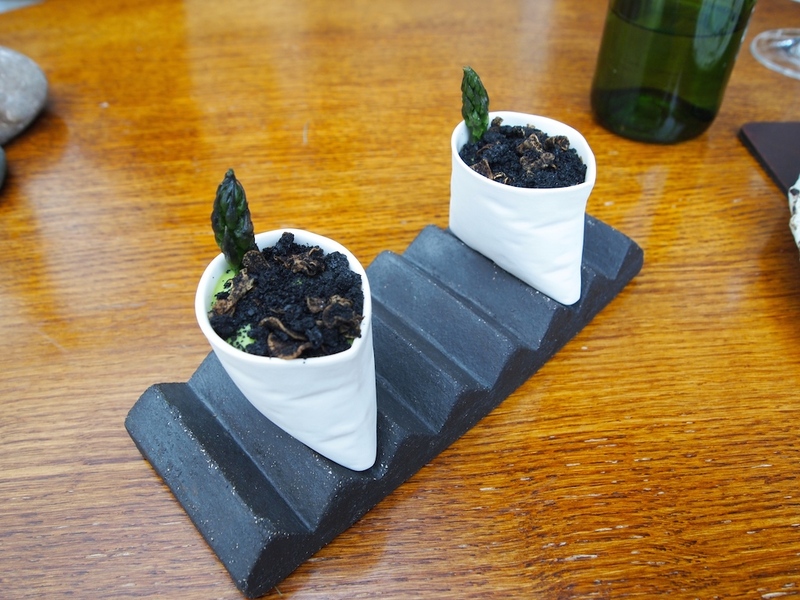 On top of this was a light and airy green asparagus foam covered with a thin layer of dried mushroom "soil" with some crisp, sliced baby mushrooms mixed in. A wonderful trio of sweet, salty and umami flavours, the sweet salinity of the shrimps matching the grassy sweetness of the asparagus wonderfully. These were six outstanding snacks, inspired and playful combinations, that worked both in flavour and in texture, and which were executed with great precision. 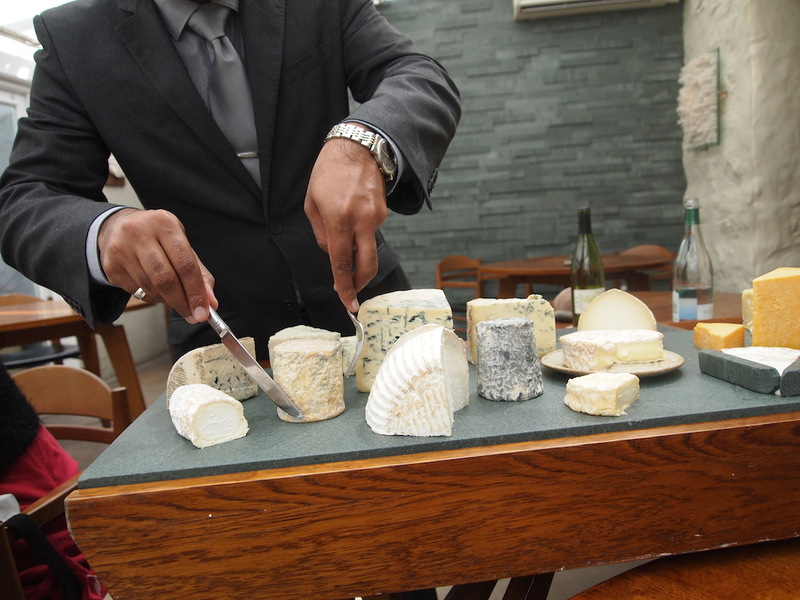 The portions increased with the next six courses. 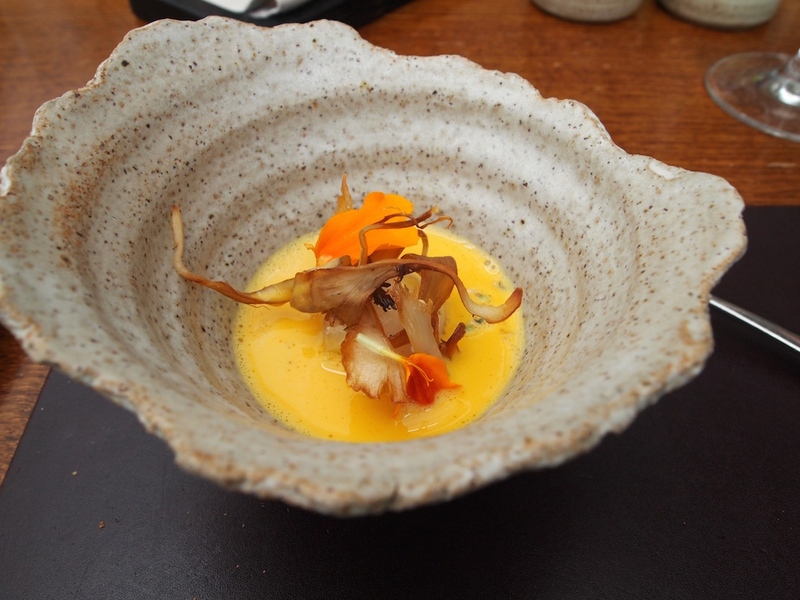 First to arrive was a colourful dish of grated salt-baked carrot served with a delicious Westcombe cheddar dumpling, thin strips of cured pork (lardo-like), crisp semi-dried Hen-of-the-woods mushrooms, and a carrot sauce. A beautifully balanced dish with refined, sweet flavours and both the pork and mushrooms brought a lovely touch of smokiness to this dish. Best of the all was the divine carrot sauce, that was full of flavour and with just the right level of creaminess. Next up, the eighth course, was chopped Shorthorn beef, lightly seasoned with charcoal oil, tabasco and smoked salt. The tartere was superbly embellished with barbecued celeriac, sliced shallots, mustard mayonnaise, candied celeriac spheres with a liquid celeriac-gin filling, diced gherkins, and finished with a sprinkling of onion powder. 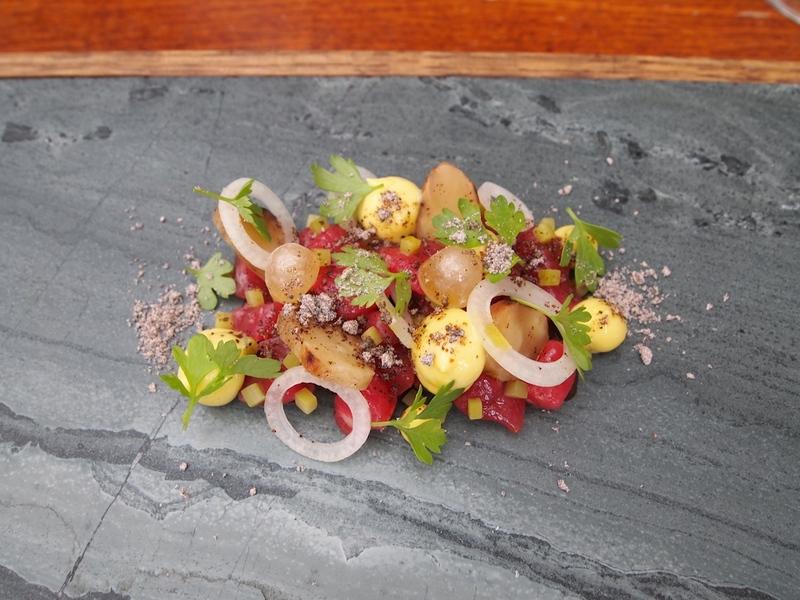 Underneath the tartare was a concentrated, sweet and tangy, apple-caper puree; these flavours initially came as a surprise, but when combined with the beef, they created a steak and barbecue sauce-like flavour experience. An exceptional dish with beautiful flavour and texture profiles, the delicate against the bold, the soft against the crunchy. Grilled scallops and cauliflower followed. A terrific interplay of flavours: the intense, caramelly nuttiness of the roasted cauliflower puree and the elegantly bitter contrast of the grilled cauliflower, worked wonderfully well with the sweet scallops. Also on the plate was some crunchy, puffed barley and a mildly sweet strawberry gel, the latter having a great touch of acidity, which lifted the dish and enhanced the sweetness of the scallops. Equally wonderful was a dish of heritage potatoes, served with soft goat's curd, crispy chicken skin, lovage cream, nasturtium leaves, a light brown meaty sauce, and fresh white crab meat with a light brown crab meat dressing. Lovely clean and vibrant flavours and an attractive hot-cold contrast between the the warm and delicate potatoes and the cool creaminess of the goat's curd. The crab brought everything together and adding some salty chicken skin was a clever touch. Then there was turbot, marvellously paired with pieces of smoked bone marrow, tender razor clams, grilled purple sprouting broccoli, broccoli puree, sea vegetables and a foamy and creamy white wine and mussel sauce. An exquisite dish, yet another beautiful balancing act between richness and freshness. The fatty bone marrow had powerful, smoky flavours, but this was balanced nicely by the mild bitters in the broccoli puree. I was particularly impressed with the mussel sauce, that was light in texture but full of deep mussel flavours. 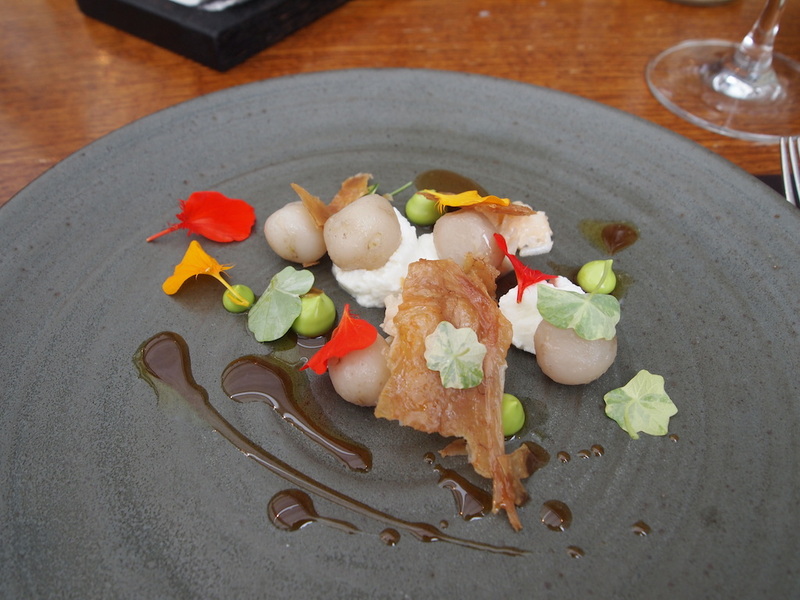 The twelfth course was an extraordinary, wonderful dish of guinea hen breast and leg, and guinea offal puree, accompanied by charred spring onions, gooseberry puree, broad beans, a fabulous guinea hen jus, and some fresh elderflowers. Expertly cooked guinea hen, tender, perfectly moist and with great caramelisation, especially on the breast; the offal puree added a nice gamey touch to the dish. The guinea hen jus had been flavoured with elderflower vinegar, which, together with tangy gooseberry puree, balanced the richness in this dish perfectly. One of the finest guinea fowl dishes I have had in recent memory - Encore! The meal continued with cheese and desserts. 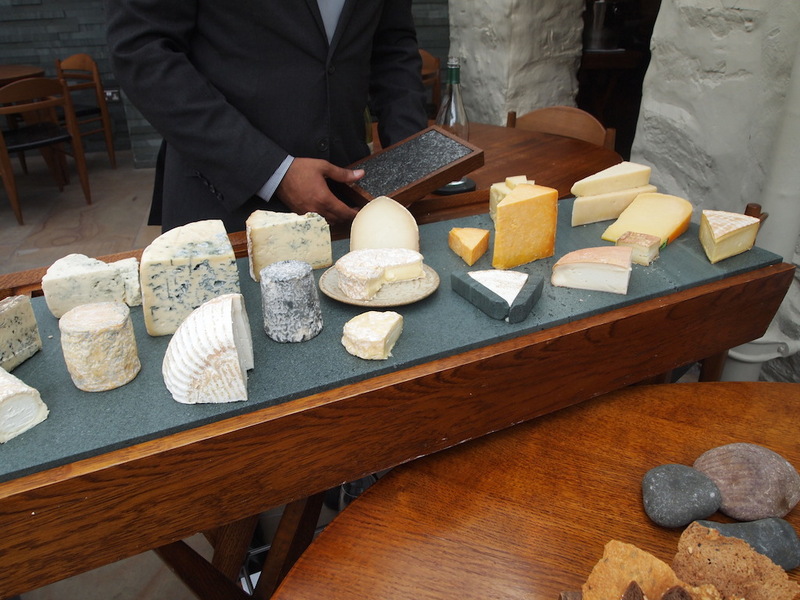 L'Enclume offers an entirely British cheese board with a great selection of cow's, sheep's and goat's cheeses. After the cheese a delicious apple and gingerbread tartlet arrived, shortly after followed by a dessert of poached pear, topped with birch sap mousse, pear ice and toasted oats. Lovely refreshing flavours came from the poached pear and the birch sap mousse added a nice touch of caramel depth. Next was a nice and warm cake soaked with spruce-gin syrup, served with sweet cheese (home made mascarpone ice cream, dropped in liquid nitrogen), an almond biscuit, fresh green (unripe) strawberries, and garnished with apple marigold. Lovely sticky and woodsy flavours coming from the spruce syrup, and the addition of the slightly tart, green strawberries really worked. A delightful dessert that was elegant and comforting in equal measure. 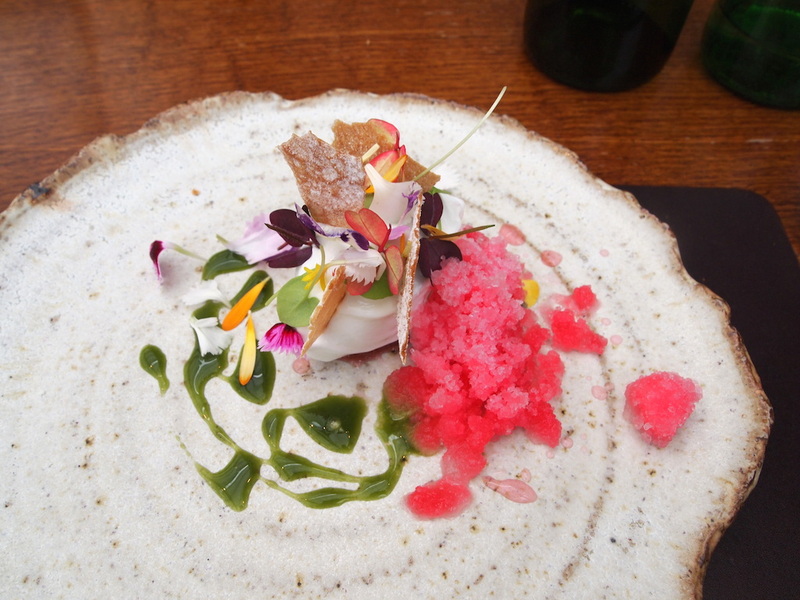 Best in show was a visually stunning dessert of perfectly smooth and milky sheep's milk ice cream with a hint of saltiness, served with rhubarb ice, poached rhubarb, tuilles dusted with yoghurt powder, a bright and grassy sorrel sauce, and garnished with garden flowers. 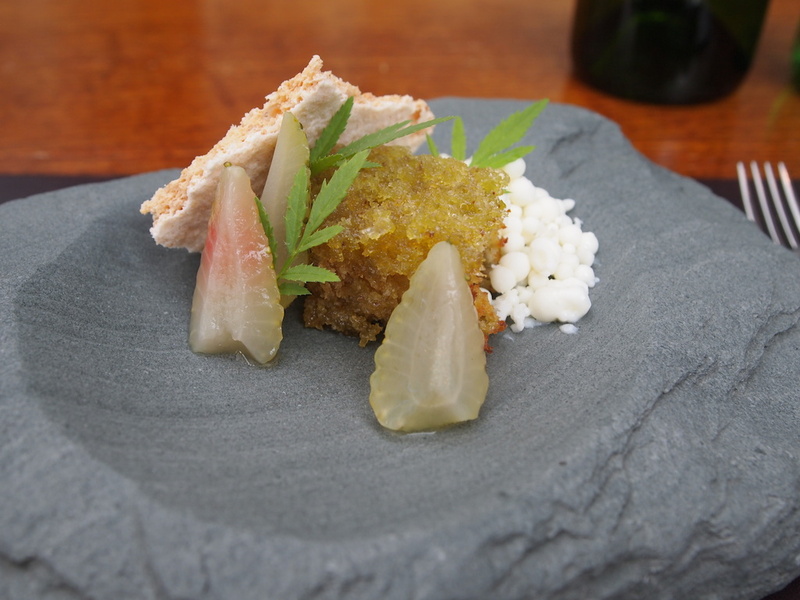 A fantastic dessert with outstandingly pure flavours and the rhubarb and sheep's milk were a perfect match. And there were some final sweet delicacies. First three cornets: an apple cornet with apple ice cream and tarragon sugar; a pear cornet with pear ice cream and wood sorrel sugar, and a strawberry cornet with sweet cicely ice cream and cicely sugar. Finally there was a crisp tuille filled with a chocolate malt mousse and covered with raspberry powder and dried raspberries. Pretty, fabulous and delicious. 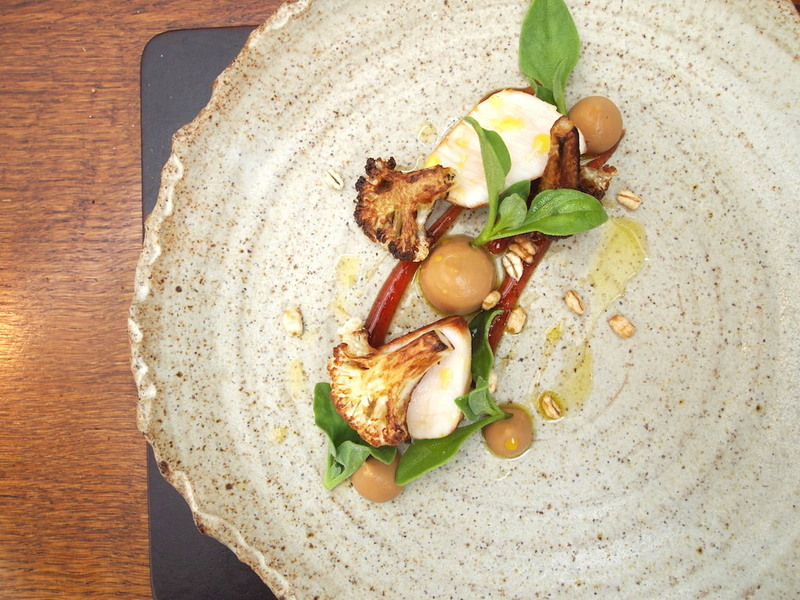 This was yet another dazzling meal by Simon Rogan, this time in partnership with his head chef Mark Birchall. One amazing dish followed another, loaded with nuanced and compelling flavours, and in this meal I was extremely impressed by the masterful texture, flavour and temperature contrasts in almost all the dishes. Both in London and in Cartmel, Simon Rogan delivers a consistent and stylistically uniform cuisine that clearly bears the personal imprint of its auctor intellectualis. 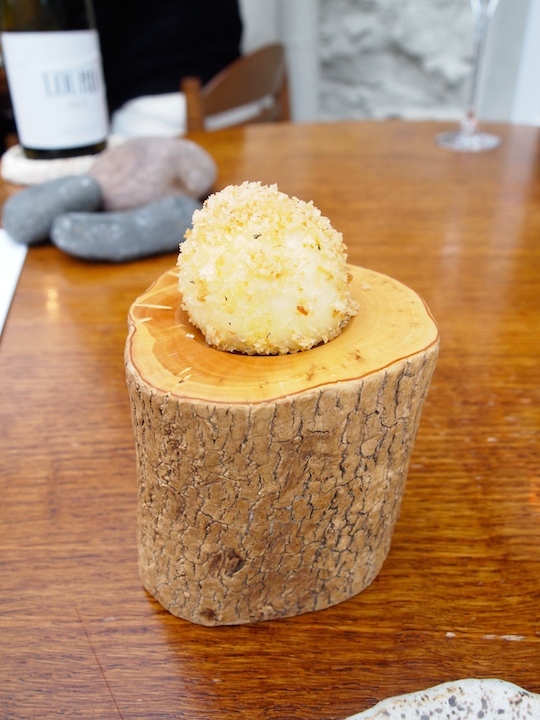 I do not usually compare restaurants, but in the case of Fera and L'Enclume it would be odd not to. 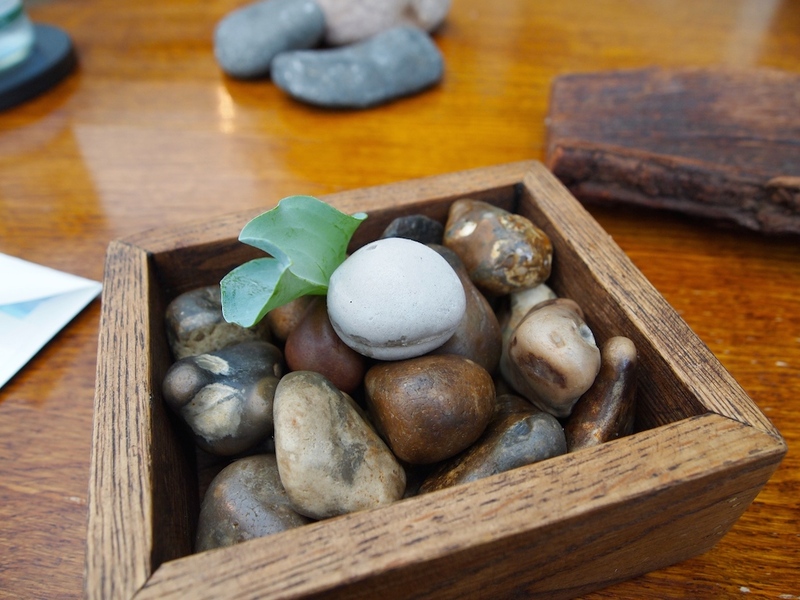 Fera does not eclipse L'Enclume or vice versa. Both deliver the same extraordinary level of quality from the beginning of the meal to the end, but the do not mimic each other, which speaks volumes for the creativity and originality of the chef and his kitchen teams. That said, Rogan's natural style of cooking is obviously ever so slightly more at home in the rural surroundings of the Lake District than amid the buzzing streets of Mayfair, where its audience will no doubt be wider. 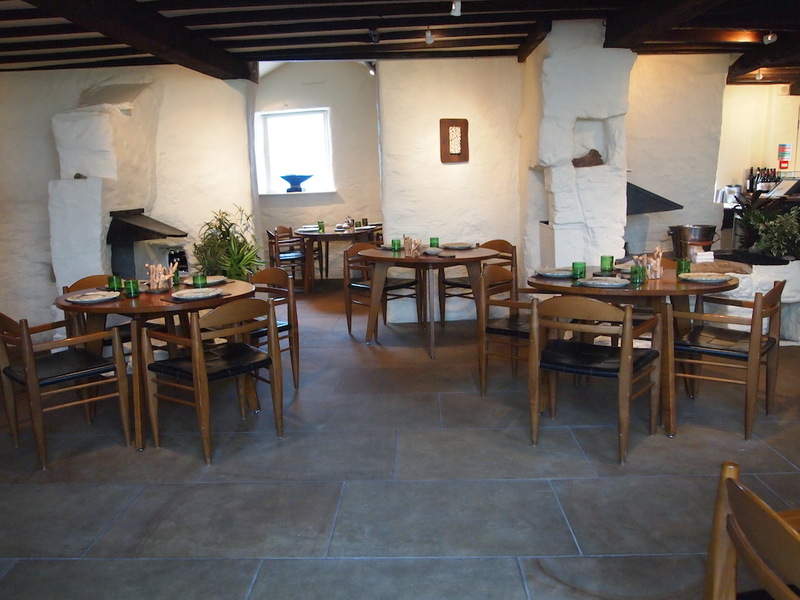 With The Fat Duck currently Down Under, I can confidently call L'Enclume and Fera the best tables in the country.